The custom of honoring the dead at burials and memorial services with trumpet and bugle calls dates back to Biblical times. Ancient trumpets were used at religious ceremonies and were associated with magical rites. Burials, circumcisions, and sunset rites (to ensure the sun would return) were a few of the early rituals in which the trumpet was used. The tradition of playing at sunrise (Reveille), sunset (Retreat), and at burials (Taps) may have evolved from these ancient services. The Ram’s Horn (Shofar), which is sounded on the occasion of the Jewish New Year, is a rite that continues to this day. The Shofar, made from the horn of a ritually killed sheep or goat, is played in the same manner as it was in the time of King David, using the same rhythms as ancient times. The instrumental range is usually limited to two notes about a fifth apart. According to Curt Sachs in his book The History of Musical Instruments, long wooden trumpets are blown at Rumanian funerals; the Babwende of the Congo carve their funeral trumpets in the magic shape of a phallos (or phallus); and in Switzerland, the Alphorn sounds the same time at sunset that the evening prayer is sung into a megaphone. In Scotland and England during the sixteenth and seventeenth centuries, trumpeters accompanied funeral processions. The musicians were dressed in black and also carried drums draped in black cloth. These funerals were for those who held high rank or were of nobility. Countries around the world have developed funeral ceremonies in which music is performed. In the militaries of many nations it is customary that a bugle sound the last call. I have checked with a few military bands and have received the following information on funeral practices. 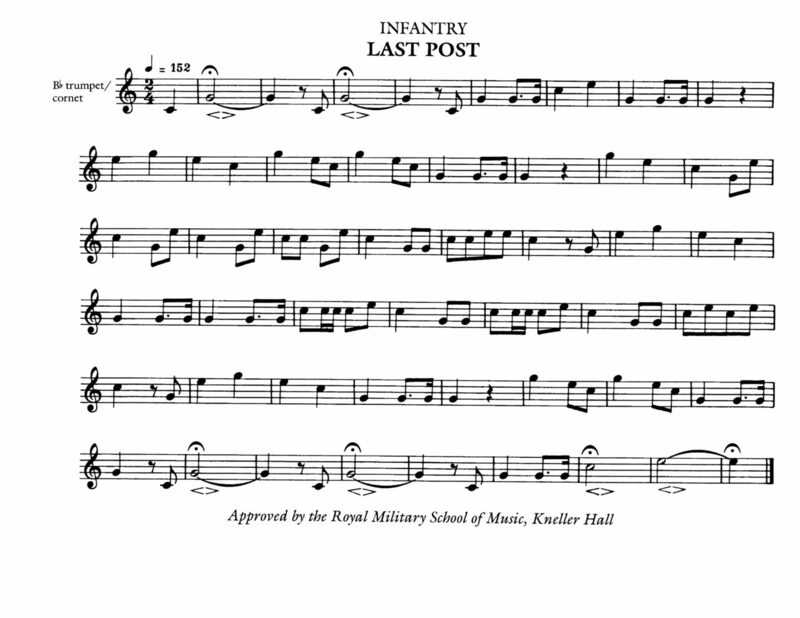 The Last Post is one of a number of bugle calls in military tradition which mark the phases of the day. 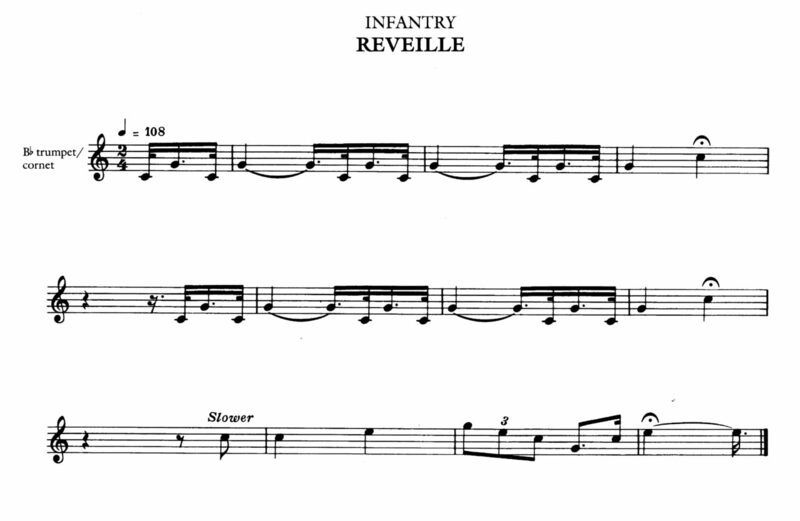 Where “Reveille” signaled the start of a soldier’s day, the “Last Post” signaled its end. It is believed originally to have been part of a more elaborate routine, known in the British Army as “tattoo”, that had its origins in the 17th century. During the evening, a duty officer had to do the rounds of his unit’s position, checking that the sentry posts were manned and rounding up the off-duty soldiers and packing them off to their beds or billets. He would be accompanied by one or more musicians. The “first post” was sounded when the duty officer started his rounds and, as the party proceeded from post to post, a drum was played. The drum beats told off-duty soldiers it was time to rest – if the soldiers were billeted in a town, the beats told them it was time to quit the pubs. “Tattoo”is a derivation of doe den tap toe, Dutch for “turn off the taps”, a call which is said to have followed the drum beats in many a Dutch pub while English armies were campaigning through Holland and Flanders in the 1690s. Another bugle call was sounded when the party completed their rounds, when they reached the “last post”: this signaled the night sentries were alert at their posts and gave one last warning to any soldiers still at large that it was time to retire for the evening. One of the first references to the call can be found in the “Preceptor for the Bugle” by J. Hyde published in 1818. It is titled 2nd Post and is in two parts. 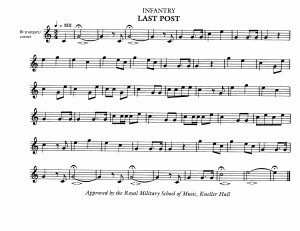 “Last Post” was incorporated into funeral and memorial services by the late 19th century in England as a final farewell and symbolizes that the duty of the dead is over and that they can rest in peace. 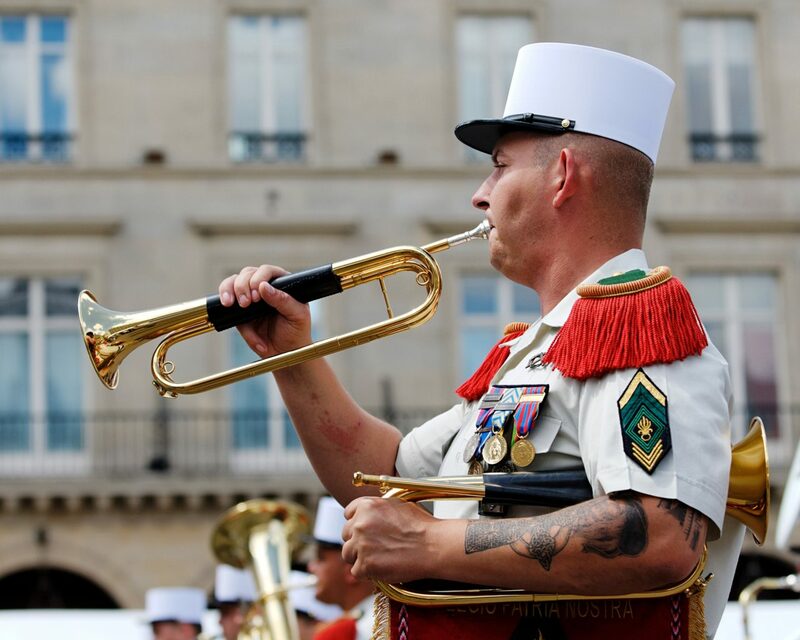 In France, at military funerals the bugle call “Aux Morts” is sounded. This call is interesting because it was composed for use by the French after World War I, making it it a relatively new call. During W.W. I Taps was heard in camps and at funeral ceremonies in France. It was reported that the French adopted Taps for their own use in the 1930s. This occurred through the endorsement of French General Henri Gouraud, whose support of it came after a visit to the United States in connection with the Yorktown Sesquicentennial in the fall of 1931. 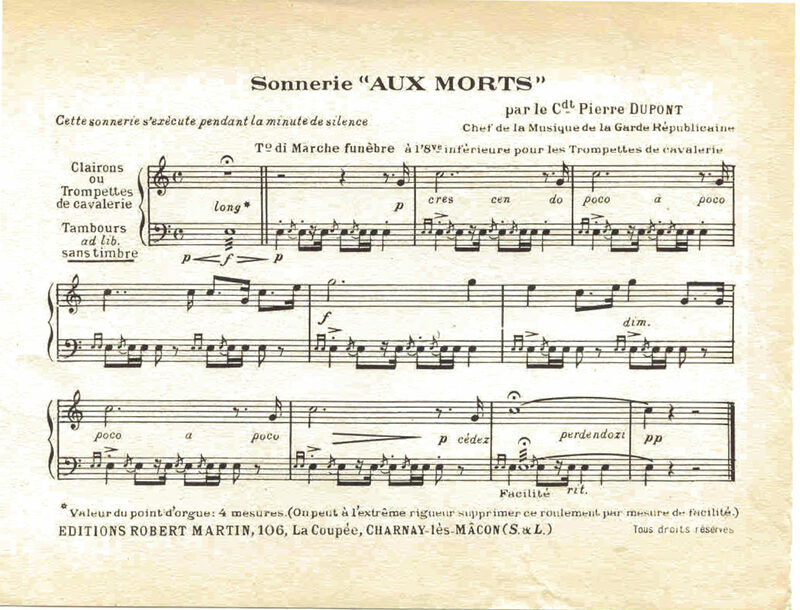 I believe that there is a mistaken thought that confuses Taps with “Aux Morts.” Both calls are twenty-four notes in length, both are sounded slowly, both soar to a high G in its musical climax, and both are played at funerals. 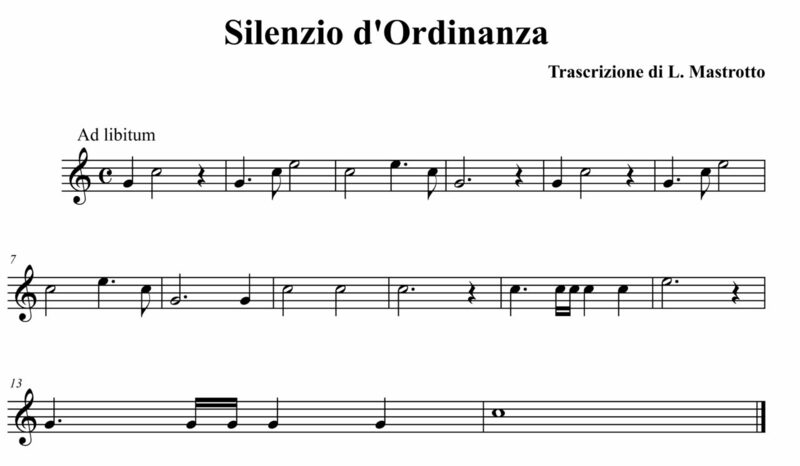 In Italy, the call for lights out is called “Il Silenzio” (The Silence) and there are two versions. Silenzio d’Ordinanza (The Ordinance) is sounded at night when soldiers have to gone to sleep and also used at military funeral services. 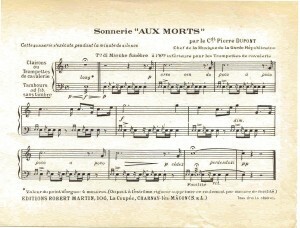 The other version, Silenzio Fuori Ordinanza (Out of Ordinance), is three minutes long and is played to celebrate the last night of military service. In Italy, military service is mandatory and lasts twelve months. This version played on a trumpet was a big hit on the Italian pop list in the 1960s made popular by the trumpeter Nina Rossi. Here it is played in the ordinance. Note that it uses the overtone series of the bugle. Unfortunately, to many, all bugle calls sound alike….. In Germany, no bugle calls are sounded at funerals. Musical support can consist of a band orÂ three drummers and one trumpet player. Funeral ceremonies take place at regular cemeteries, as there are no national or military cemeteries. At the end of the ceremony, the band plays the chorale “Ich hatt einen Kameraden” (The Good Comrade). 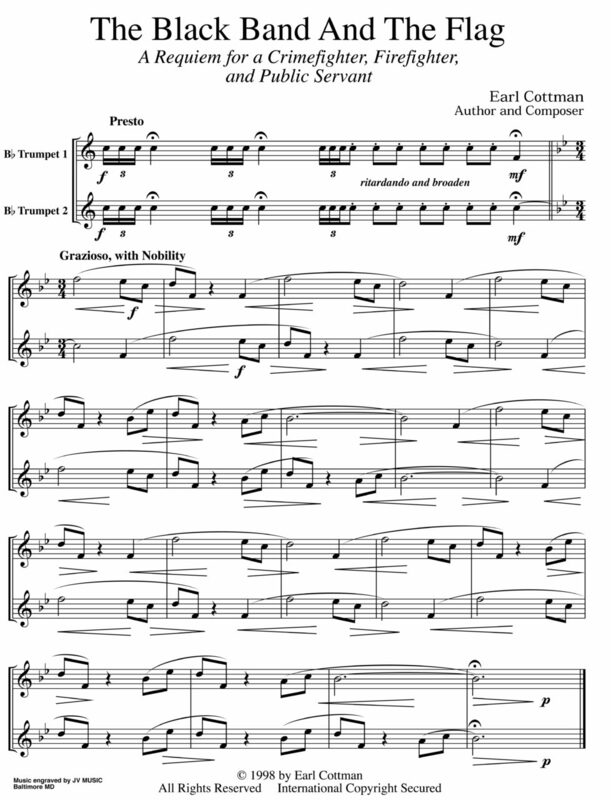 If there is no full band available, this hymn is played by one trumpeter only. In the United States, the sounding of Taps is not reserved for the army, but other branches of the military and quasi military organizations have their own uses for Taps. Just when the U.S. Navy adopted the custom of sounding Taps at funerals is unknown. Bugles have been on U.S. warships since the the 1830s. The Dead March from Saul has been mentioned in some documents as being played on shipboard during the early nineteenth century along with muffled drums, but there was no mention of Taps. A 1918 Navy manual states that Taps is to be sounded as an honor when a warship passes Washington’s Grave at Mount Vernon between sunrise and sunset. Certainly other services have used Taps at ceremonies. 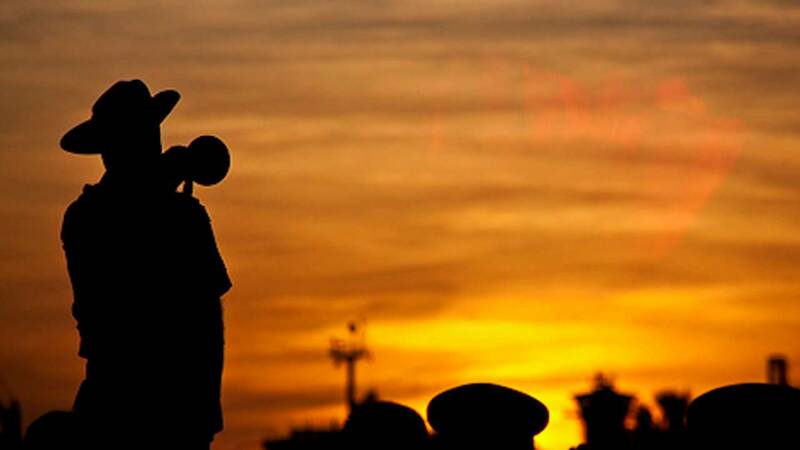 The U.S. Marines close their Friday Night Parades at the Marine Barracks in Washington with the sounding of Taps by a member of the Drum and Bugle Corps perched high on the top rampart of the barracks. A special rendition of Taps for six trumpets was arranged in 1930 by Col. Richard J. Dunn, Band Director of the Aggie Band, for use at annual ceremonies at Texas A&M University. This ceremony is the Aggie Muster, which commemorates San Jacinto Day, the victory on April 21, 1836, by Texans over Santa Anna. Police and fire companies sound Taps as last honors for those killed in the line of duty. Most ceremonies I’ve witnessed have used two trumpeters sounding Echo Taps. Echo Taps is not sounded in the military because of manning requirements and the fact that it is difficult to make the music work well. Also, it really is a piece for solo bugle. When performed outside, two trumpeters standing at a distance have a hard time making the intonation sound good. In 1998, Earl Cottman, a retired U.S. Treasury agent from Baltimore, Maryland, introduced a new call to be played in place of Taps. This piece is entitled “The Black Band And The Flag–A Requiem for a Crimefighter, Firefighter, and Public Servant.” While this selection is not true bugle music, in that it is not limited to the notes of the bugle scale, it has been performed at a number of funerals for police officers killed in the line of duty. 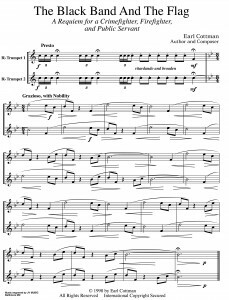 There are also numerous pieces for piano and voice written in the early twentieth century that feature the music of Taps in their compositions. This entry was posted on Wednesday, May 31st, 2017 at 12:42 pm	and is filed under Bugle Stories, History of Taps. You can follow any responses to this entry through the RSS 2.0 feed. You can leave a response, or trackback from your own site. Il Silenzio (The Silence) is an instrumental piece, with a small spoken Italian lyric, notable for its trumpet theme. It was written in 1965 by trumpet player Nini Rosso and Guglielmo Brezza. 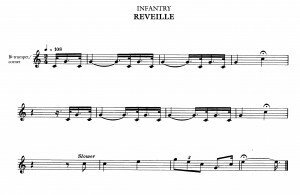 Its thematic melody being an extension of the same Italian Cavalry bugle call used by the Russian composer Tchaikovsky to open his Capriccio Italien (often mistaken for the U.S. military bugle call “Taps”). “Il Silenzio” is a memorial piece commissioned by the Dutch and first played in 1965 on the 20th anniversary of the liberation of the Netherlands. Yours is a wonderful website devoted to that very short piece of music that never fails to stir me. I visited it this time to get the correct page URL to forward to a number of people who had received one of the Internet messages that contained a link to the girl’s performance and falsely said that it was a variant of Taps. Thank you for your effort to produce and maintain this website, and for your service to the Country.